The capitalists often boast that their constitutions guarantee the rights of the individual, democratic liberties and the interests of all citizens. But in reality, only the bourgeoisie enjoy the rights recorded in these constitutions. The working people do not really enjoy democratic freeedoms; they are exploited all their life and have to bear heavy burdens in the service of the exploiting class. 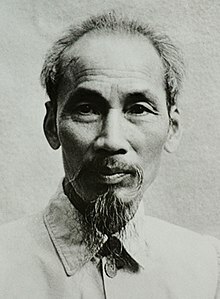 Hồ Chí Minh (May 19, 1890 – September 2, 1969) was a Vietnamese revolutionary and statesman, who later became Prime Minister (1946–1955) and President (1955–1969) of the Democratic Republic of Vietnam. The hour has struck! Raise aloft the banner of insurrection and lead the people throughout the country to overthow the Japanese and the French! The sacred call of the fatherland is resounding in our ears; the ardent blood of our heroic predecessors is seething in our hearts! The fighting spirit of the people is mounting before our eyes! Let us unite and unify our action to overthrow the Japanese and the French. In practice, the enemy has been making much more propaganda for us than we have ourselves. In a war, to win a victory or suffer a defeat are common things. THe essential is that we must win final victory. We must help all officers and men and the people to bear that firmly in mind so that they will not be self-complacent when winning and disappointed when losing, but instead will always make utmost efforts to overcome difficulties and hardships and advance towards final victory. To have a good crop we must weed the field, otherwise the rice will grow badly in spite of careful ploughing and abundant manuring. To be successful in increasing production and practicing thrift, we must also weed the field, that is root out embezzlement, waste and bureaucracy. Otherwise they will harm our work. We want to build a new society, a free society where all men are equal, a society where industry, thrift, integrity and uprightness prevail hence we must wipe out all bad habits of the old society. The duty of the cadres is to love and take care of every fighter and to value and save every cent, every bowl of rice, every work hour of their compatriots. Our fighters and compatriots have the right to demand that the cadres fulfill this task, and to criticize those who do not. Democracy means to rely on the masses, correctly follow the mass line. Hence to be successful, the movement against embezzlement, waste and bureaucracy must rely on the masses. It is crystal clear that once victorious, socialism can never tolerate the personality cult and its harmful consequences. The energetic measures taken by the Central Committee of the Communist Party of the Soviet Union to do away with the personality cult, and its consequence, set a brilliant example of unprecedented political boldness. Obviously, Lenin meant that the stage of fierce civil war and the restriction of democracy imposed on the Soviet people were only provisional and had to be abolished as soon as the new regime was consolidated. The CPSU again demonstrates that the most important aspect of self-criticism is to practically and effectively correct one's errors. Only in a socialist system are the interests of the individual, the state and the collective at one. That is why only a socialist constitution can encourage the citizens to fulfill enthusiastically their duties to the society and the fatherland. The capitalists often boast that their constitutions guarantee the rights of the individual, d3mocratic liberties and the interests of all citizens. But in reality, only the bourgeoisie enjoy the rights recorded in these constitutions. The working people do not really enjoy democratic freeedoms; they are exploited all their life and have to bear heavy burdens in the service of the exploiting class. In thousands, horses and infantry chase each other. Move quickly into action, in attack or in retreat. Talent and swift feet give us the upper hand. People who come out of prison can build up the country. "Hard is the Road of Life"
Our era being a civilized, revolutionary era, one must rely all the more on the force of the collective, of society, in all undertakings. More than ever the individual cannot stand apart but must join the collective, join society. To make the revolution to transform the old society into a new one is a very glorious, but also extremely heavy task, a complex, protracted and hard struggle. Only a song man can travel a long distance with a heavy load on his back. A revolutionary must have solid foundation of revolutionary morality in order to fulfill his glorious revolutionary task. To study Marxism-Leninism is to learn the spirit in which one should deal with things, with other people and with oneself. It means to study the universal Marxist-Leninist truths in order to apply them creatively to the practical conditions of our country. We must study with a view to action . Theory must go hand in hand with practice. Individualism spawns hundreds of dangerous diseases: bureaucratism, commandism, sectarianism, subjectiveness, corruption, waste ... It ties up and blindfolds its victims whose every action is guided by their desire for honor and position, not by concern for the interests of the class and the people. Revolutionary morality consists, in whatever circumstances, in resolutely struggling against all enemies, maintaining one's vigilance, standing ready to fight, and refusing to submit, to bow one's head. Only by so doing can we defeat the enemy, and fulfill our revolutionary tasks. Revolutionary morality consists in absolute loyalty to the Party and the people. Revolutionary morality does not fall from the sky. It is developed and consolidated through persevering daily struggle and effort. Like jade, the more it is polished the more it shines. Like gold, it grows ever purer as it foes into the melting pot. Our party has a mass character, and hundreds of thousands of member. Owing to the situation in our country the bulk of Party members spring from the petty bourgeoisie. There is nothing surprising in it. IN the beginning under the influence of bourgeois ideology the stand of some Party members may lack firmness, their outlook may be confused and their thinking not quite correct, but owing to the fact that they have been tempered in the revolution and the war of resistance, our Party members are by and large good militants, faithful to the Party and the revolution. Those Comrades know that those Party members who commit errors will lead the masses into error; therefore, they stand ready to correct any mistake they may make, and this in a timely way, and do not allow small errors accumulate into big ones. They sincerely practice criticism and self-criticism, which makes it possible for them to progress together. Revolutionary morality consists in uniting with the masses in one body, trusting them and paying attention to their opinion. By their words and deeds. Party and Working Youth Union members and cadres win the people's confidence, respect and love, closely unite them around the Party, organize, educate and mobilize them so that they will enthusiastically implement the Party's policies and resolutions. Under the banner of Marxism-Leninism, let our party, with the seething spirit of an invincible army, unite even more closely, and lead our working people boldly forward to new victories in the struggle for socialist construction in the North and for the reunification of the country. Though frontiers and mountains stand between us, Proletarians of the whole world come together as one family. Our cause is just our people are united from North to South; we have a tradition of undaunted struggle and the great sympathy and support of the fraternal socialist countries and progressive people all over the world. We shall win! All my life, U have served the fatherland, the revolution and the people with all my heart and strength. If I should now depart from this world, I would have nothing to regret, except not being able to serve longer and more. Variant translation: Nothing is more valuable than freedom and independence. The Trotskyists are not only the enemies of Communism, they are also the enemies of democracy and of progress. They are the most infamous traitors and spies. Nothing is more precious than independence and freedom... Independence without freedom is worse than no independence. There was one exception to the rule that all our foes have committed and that is the Decadence Assumption. Ho Chi Minh never underestimated America. His avowed hero was George Washington and he remained in awe of the U.S., all his life. He remains the only enemy leader who ever defeated us at war, and then only because our hubris (not decadence) got the better of us. I have met many people in the course of my political career, but none has made such a particular impression on me. Believers often talk of the Apostles. Well, through his way of living and his influence of his peers, Ho Chi Minh was exactly comparable to these 'holy apostles'. Although Ho was prominent in founding the French Communist Party and the Indochinese Communist Party, he was above all else a nationalist who sought a unified, independent Vietnam. Only after democratic nations such as France and the U.S. refused to support the DRV's bid for independence did Ho turn to China and the Soviet Union for support; both extended diplomatic recognition in January 1950. Ho left no significant theoretical innovations, much less an integrated body of theory. This has, of course, no prevented some in the Vietnamese Communist Party from claiming that Ho left behind 'Ho Chi Minh Thought', which was described as a new development in Marxist Leninist theory.